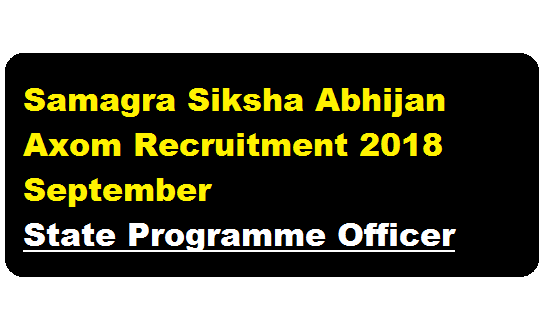 Samagra Siksha Abhijan Axom Recruitment 2018 September | State Programme Officer :- Samagra Siksha Abhijan Axom recruitment notification is declared in the month of September 2018. According to the recruitment, application are invited from the eligible candidates not more than 45 (forty five) years of age for the post of State Programme Officer under Samagra Siksha Abhijan, Axom . You must note that this post is temporary and the selected candidate will be initially engaged for a period of 11 (eleven) months only. The detailed info can be found below. In this section, we will discuss in details about the recruitment of State Programme Officer Post under Samagra Siksha Abhijan Axom Recruitment 2018 with vacancy details, eligibility criteria, salary with other details and requirement. • 10 years of experience as Instructor of BTC/ Normal School, Higher Secondary level. Desirable Skills : For the post it is desirable to have Good Writing Skill and Knowledge for Skill Development / Vocational Skills. Also Knowledge on Life Skill and Learning Enhancement. Interested candidates having the requisite qualification may send Application in plain paper stating clearly (i) Name of Applicant (in capital letter), (ii) Name of the post, (iii) Permanent Address, (iv) Address for communication, (v) Contact Mobile No./Telephone No., (vi) Age on 1st January, 2018, (vii) Educational Qualifications, (viii) Working Experiences along with one self attested copy of passport size recent photograph and attested copies of Certificates/testimonials relating to Educational Qualifications, Experiences etc. should be submitted to the Mission Director, Samagra Siksha Abhijan, Axom, Kahilipara, Guwahati-19 latest by 3 p.m. on 28.09.2018.